Dress it on the paddle and be fast. Don’t go too heavy on the sauce. A small amount of rice flour on the paddle helps also. So the longer it sits on the paddle the harder it is to get off? I also use flour. Just depends on my mood and how my dough is acting. Wood is best for uncooked, metal best for turning/removing. Dont over sauce, and dont let it stay raw on the peel at all. Get it in the oven ASAP. I find cornmeal burns. Just AP flour works fine if the dough doesn't have holes, and isn't oversauced. I agree with cornmeal burning. Can’t use it with high temp cooks. It also takes a ton of practice. I have made a lot of pizzas on my grill and still screw up here and there. It’s not easy, but damn it’s good when it’s right. Dont use an oil and fresh dough. Cornmeal and garlic salt for a little extra kick. 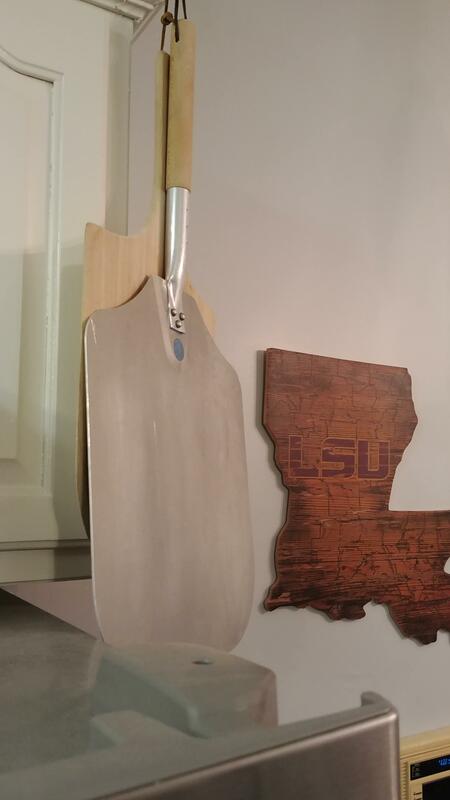 I keep forgetting about about a pic of my stainless and cypress pizza peel for the other thread. This has helped me the most. I also prep mine on a big cutting board and use a thin metal peel. The thinness ans dusting with flour make it a quick easy transfer. Hate my wooden peel. It's now my cutting board. Parchment paper is what I use. I don’t like burned gritty cornmeal or excessive flour, and I’m too slow at crust....it will stick to the peel while I’m adding stuff to the pie. So I shape the crust and put on parchment. Add toppings, slide paper and pie onto peel and into oven. I bake on a steel plate, so I can slide out the parchment after about 30-60 seconds of cooking to give the bottom crust some direct contact with the hot steel. Pizza screens will change your life. Most restaurant stores have them. Season them first like you would a skillet. I also grill my pizzas on foil. I use cornmeal on the peel and on the stone. I just scrape it off between pizzas because yes it burns. Also less sauce and toppings is better. I use a Big Green Egg Pizza stone because it is thick and really holds the heat well. I use it on the egg and the gas grill as well. Call me crazy but I figured out a solution that works for me (after making multiple calzones out of pizzas). I roll out and shape the crust on a cookie sheet and put in a 400 degree oven for about two minutes. This removes the stickiness. Then I put on pizza peel, add toppings, and put on the grill. No more fail. Pizza screens will change your life. Seconded. Non-stick, no-mess, and still allows your dough to properly brown on the bottom. I don't even use my peel any more after picking up screens. I'd love to see photos of these pizza yall are making. Some of the recommendations in here sound fine for one or two pizzas, but there's no getting around being able to use a peel to put a pizza on a scorching hot iron steel/stone if you're making more than 2. It just takes too long.